Are we witnessing a major overhaul of scholarly communication rules and tools? In the last six months alone, this blog has featured posts on all phases of the research cycle. From Wikipedia (discovery) to replication (analysis), Chrome extensions for reference management (writing), the Open Library of Humanities and RIO Journal (publishing), Twitter & blogging (outreach), altmetrics, R-index and Publons (peer review and assessment). How to get on grip on the myriad of new tools and standards? Should researchers drop everything they always took for granted? Will switching to open tools make research workflows more efficient? And should that be the goal anyway? Our current research may help researchers and other stakeholders understand what is going on. Almost half of the tools in our database of scholarly communication tools were created since 2013. The rate at which new tools appear to a certain degree reflects the relative ease with which one can create online tools. On the other hand tool creators apparently deem it important to build a tool that supports a new way of working, or that repairs faults and omissions in existing tools offered by the major players (be it publishers, tech companies or venerable societies). The push for new tools comes from funders (e.g. demanding data archiving of Open Access) but also from researchers themselves that want to capitalize on the possibilities of the internet in collaborating. Especially for experimenting / collecting / mining data, writing, journal selection, publishing and outreach we witness a surge of new tools. We use a simple model to get a grip on this abundance and variety of tools. The G-E-O model looks at whether the tool makes science Good, Efficient or Open. Tools that make science more open are for instance those facilitating open access, open data, open peer review or even open drafting. Also many outreach tools contribute to openness. For many tools that work towards openness there are barriers such as copyright and the business models of the big publishers. Tools that make science efficient are mostly working on standardization (such as DOI or ORCID), interoperability and well connected platforms. These are mostly technical improvements and standards, that few people oppose to. Finally you’ve got tools that go for ‘good’ science, where good mostly implies reproducible, transparent and fair. This is about reporting, acknowledgment, credit, assessment and quality checks. They are all part of research governance, which is the set of rules and norms created by (associations of) universities, societies and publishers. So far, we see enormous amounts of efficiency tools, a fair share of openness tools but only a handful of tools that explicitly aim for reproducible or fair science. To investigate the choices researchers themselves make in this respect, we are currently engaged in a global, multilingual survey asking researchers across all disciplines, career stages and countries for their tool usage for 17 research activities in their workflow. Some 5,500 researchers worldwide have responded so far, and we hope to double that number before the survey ends in February, 2016. The survey uses self-selected non-probability sampling. The bias issues inherent to this approach will be addressed with targeted distribution during the runtime of the survey and afterwards with statistical operations. Some 60 institutions across the globe have already partnered with us to distribute the survey within their own organization using custom URLs, allowing us to share institutionally tagged data with them. We think the survey can become one of the largest multilingual surveys into researcher practices. Insights from these data, which will be made public in raw, anonymised form, will be valuable for libraries, research support, funders, but also for researchers themselves. They also get immediate preliminary feedback from the survey. 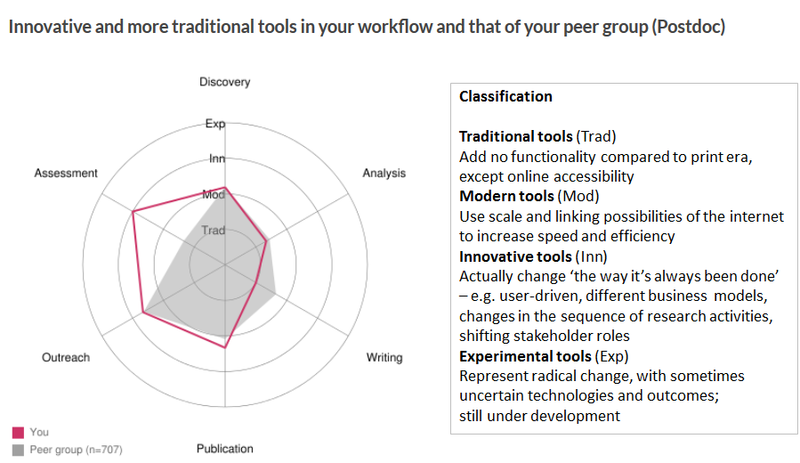 For the six phases of the research cycle, a radar chart shows whether someone’s tool usage is more traditional or more innovative than the average of their peer group. The reasons for and implications of changing tool usage are the next step of our research, and will be the subject of follow-up in-depth studies with a subset of respondents and with tool creators. For researchers it is important to know whether using a new tool will reduce time needed to get desired results or even get results that were hitherto impossible to get. Assessing this is not straightforward, because the use of tools, platforms and websites is tied together over the entire research cycle. Ideas, information, data, publications and assessment move through this cycle and researchers need transitions from one tool or platform to the other to be smooth. Interoperability of tools is key. In addition, researchers’ actions and options are not isolated and individual, but linked to the entire ecosystem of tools. Researchers like an efficient workflow, but big players are also taking a workflow/ecosystem view to developing their portfolio of tools. That is the strategic reason for Elsevier to buy and expand Mendeley and for SpringerNature to work with Digital Science within Holtzbrinck. Alternatively you can envision Google and Wikimedia scholarly ecosystems. In order for science to proceed unhindered by (proprietary) company ecosystems or the idiosyncrasies of individual researcher workflows, it is increasingly important that we define a set of protocols, principles, API’s, formats and ID’s to enable any kind of research object to move freely between researchers wanting to add, reuse, comment, and any action and actor to be defined and easily referenced. It is good to know that Force11, the network of forward thinking people in scholarly communication, will organise a number of workshops next year to imagine what exactly is needed for a future with a scholarly commons. Jeroen Bosman and Bianca Kramer work at Utrecht University Library, as geosciences librarian and librarian for biomedical sciences, respectively. They are charting the changing landscape of scholarly communication in their project ‘Innovations in Scholarly Communication’ and are members of the steering group of the Force11 Scholarly Commons initiative. They can be found on Twitter as @jeroenbosman and @MsPhelps. This is really interesting. 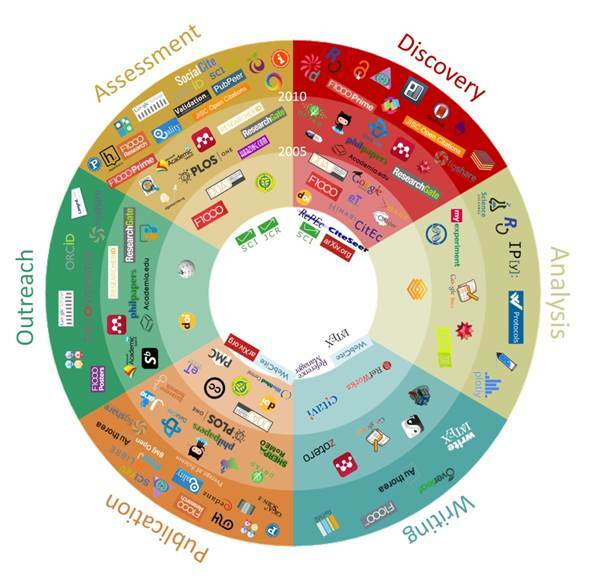 There are a lot more tools available for scholarly communication. It’s a more flexible approach where content can be shared in different ways for new audiences. It’s exciting too because it means research doesn’t need to be in a text form all the time. The results of the survey described in this post our now out in raw, cleaned and graphical formats: https://101innovations.wordpress.com/ They contain the answers of 20663 respondents from across the globe.